Topics: Custom Kitchen Cabinets, Fireplace Mantels, Wall Units, Wall Paneling, Entertainment Centers, and Bathroom Vanities. The estimated 12 daily visitors, each view 7.00 pages on average. It is hosted by American Registry For Internet Numbers (Virginia, Chantilly,) using Apache web server. 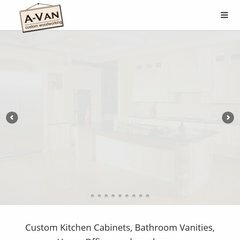 A-van.com's server IP number is 70.84.170.203. Its 2 nameservers are ns314.websitewelcome.com, and ns313.websitewelcome.com. PING (70.84.170.203) 56(84) bytes of data. A ping to the server is timed at 79.7 ms.